It is time to celebrate with Marvel Cinematic Universe in its achievements in putting into cinema, the once were on comics stories of heroism and the like. This video reminds me of the days when I first watched the movies. This is sort of a trailer to the latest movie created by MCU, the Guardians of the Galaxy though it is not just the main thought. The video is a reminder that Marvel Cinematic Universe is constantly doing its best in order to give life to the characters that we loved. I grew up reading about Marvel characters and it excites me every time I watch movies like this. 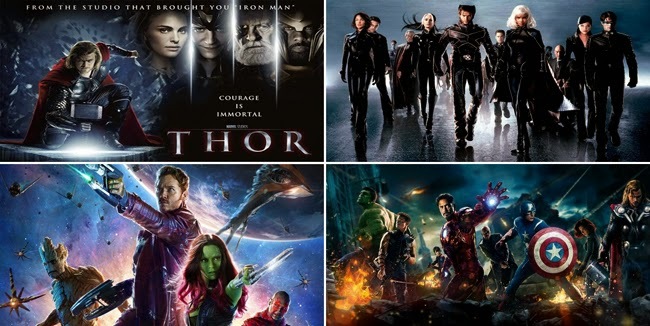 You have to watch the latest movie of Marvel Cinematic Universe and be lost in space with different characters that will give life to heroism. It is a must to watch the movie. What I like the most about Marvel is the things that the characters are saying. I’m fascinated with how the storylines were made in such a way that it will impact the viewer. It is not just enough to have good fight scenes, stunts, animations, etc. it is still the story that counts the most. There are so many Marvel fans out there who are so into the release of movies. And think of Spiderman, Iron Man, Thor, Captain Amerika, Hulk, Wolverine, Professor-X and many more. Well, Marvel is a world created where realities are fantasies synchronized to bring lessons. And I do believe that you are learning every time you watch a Marvel movies. I am now reminded of Toby McGuire in Spiderman II. He’s simply brilliant but lazy.